Micelness þisre forebysene: 750 be 600 dotta. Ōðra biliða micelnessa: 300 be 240 dotta | 600 be 480 dotta | 960 be 768 dotta | 1,280 be 1,024 dotta | 3,000 be 2,400 dotta. English: Members of U.S. Armed Forces Women's Volleyball team blocks an Italian player from scoring during the 3rd Military World Games held in Catania, Sicily. The Military World Games consists of 86 participating countries and were designed to promote "Peace through Sports." 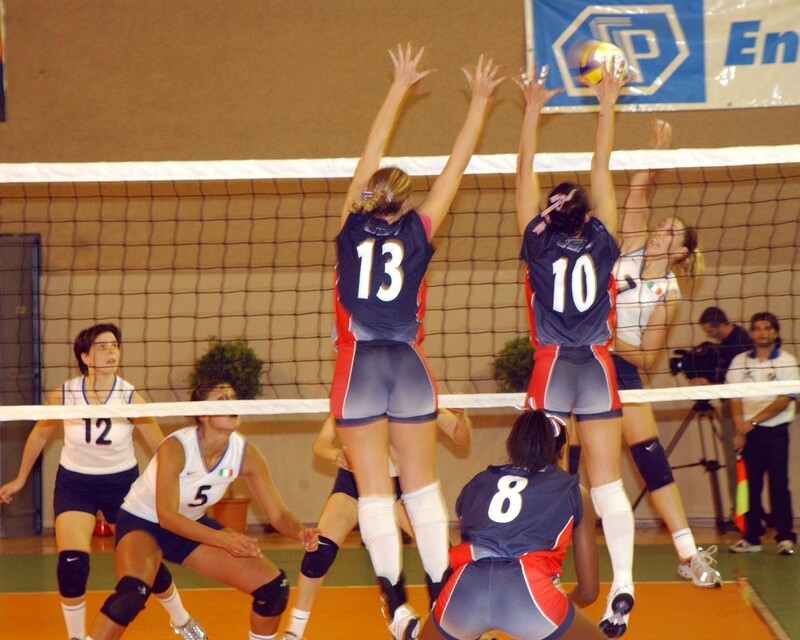 031205-N-2468S-002 CATANIA, Sicily (Dec. 5, 2003) -- Members of U.S. Armed Forces Womens Volleyball team display teamwork by stopping an Italian player from scoring. Both teams were participating in the 3rd Military World Games held in Catania, Sicily. The Military World Games, designed to promote "Peace through Sports" has 86 participating countries. Photo by Photographer's Mate 2nd Class Terry Spain. (Released). Credit as U.S. Navy photo by Terry Spain.